Since these are complex metal deposits, the only practical way of assessing and comparing the grade of the deposits is by converting everything to a Silver Equivalent value (AgEq). 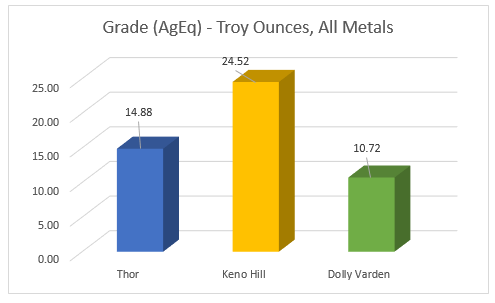 When this is done, the results show that Dolly Varden is the lowest grade deposit (10.72) and Keno Hill is the highest grade (24.52). Thor occurs in between at 14.88. What has to be borne in mind is that the grades are relevant to how the deposits are mined. In the case of Dolly Varden and Keno Hill, unusually high-grades are required because the mining method is underground, and the mined areas tend to be thin and accessible using only costly underground mining methods. The opposite is true at Thor – if much of the deposit can be mined using open-pit methods, then the deposit is able to support much lower grades, and the tonnage can be dramatically increased by being able to profitably mine material with a much lower cut-off grade.